Mint Chocolate would be my favorite! Attune wellness bars are packed with with probiotics that can help promote healthy digestive and immune systems. Each bar contains five times the live active cultures found in a serving of yogurt! Each one has just 80-90 calories, meaning you can eat one every day without any guilt. Think of it as your daily dose of chocolate. Each Attune wellness bar also gives you 25% of your daily recommended calcium and 3 grams of dietary fiber. And did I mention they're chocolate bars? Actual chocolate bars, not just chocolatey-flavored, in seven different varieties. Plus three probiotic granola bars if you're (totally insane) not into chocolate. Okay, maybe I am exaggerating…two of the three granola offerings also contain chocolate. Attune is a company after my own heart– and tummy! Probiotics help to regulate the body's own inner flora that can get out of whack with our stressful lives and rushed diets. Your body can act against itself and cause intestinal problems like cramps and bloating. I just finished up the Attune 14-day Challenge with a week's supply of the Chocolate Crisp and Coffee Bean Dark Chocolate bars*. It was definitely easy to remember to eat a bar a day- at .7 oz, the serving size is small. I had assumed I would want to plow through the entire 7-bar week's supply in one sitting but the chocolate is actually flavorful enough to be satisfying. I especially liked the crunch of the rice in the Chocolate Crisp and the coffee beans in the Coffee Bean Dark Chocolate, although my daughter said the latter made my breath stinky! I am feeling less puffy than I ordinarily would around this time of the month (sorry if that's TMI), so I am attributing that to Attune. To enter and win enough bars to embark on your own Attune 14-day Challenge, please comment on this post with your favorite Attune Probiotic Wellness Bar flavor. Entries will be accepted through March 31st and I'll pick the winner using Random.org. US readers are eligible. 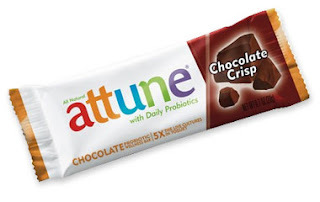 *Disclosure: I received the two boxes of Attune bars reviewed above in order to write this review and they are sponsoring the prize for the giveaway. No other compensation was given and my opinions were not shaped by receiving free product. Although I suppose I wouldn't have known it existed otherwise. FYI. My favorite flavor is Almond Milk Chocolate :) *Thanks* for the giveaway! The Dark Chocolate Probiotic Bar sounds great. Blueberry vanilla would be my choice. My favorite would be the Chocolate crisp. They look good! I follow you on Twitter. BenSpark. The Coffee Bean Dark Chocolate looks like it would be RIGHT up my alley! Thanks so much! These look fabulous!